When I see Ryder try to crawl (he is so so close), watch him laugh at his brother and sister and see the look in his eyes knowing he wants nothing more than to be running with them.. I know it will go fast. I quickly see my baby becoming less and less of a baby. He is almost 11 months old! How did happen. But I realized I have a good way of getting my baby fix. 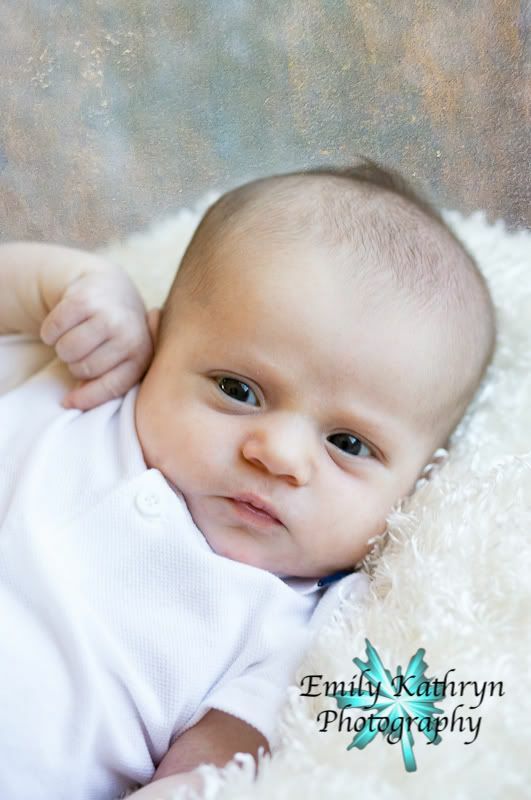 Newborn photo shoots. 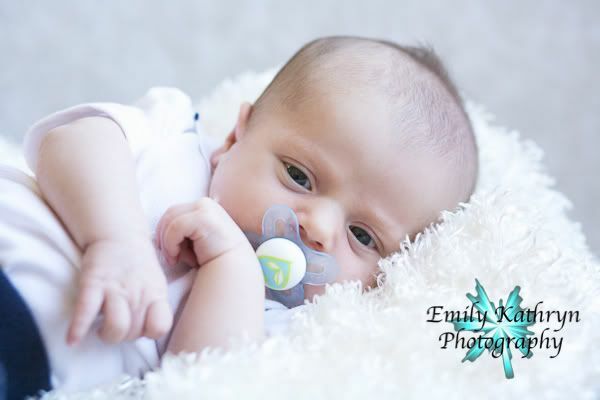 On Friday I shot the cutest little guy-though he wasn't so new or little anymore as he was almost a month old-so it was more of a baby shoot than a newborn shoot. But just holding him made me realize how big Ryder really is and how fast it goes. So do you want to see some of the shots? I am still working on post processing, but here are a few favorites so far. 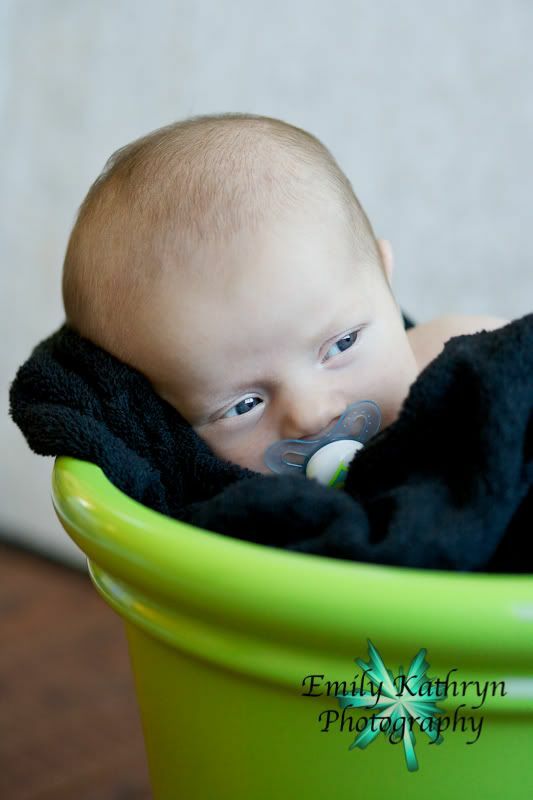 He almost fell asleep in that bucket-though the little stinker was awake the whole time. And my Emily Kathryn Photography logo-I have decided I really don't like it. I don't have to worry about offending anyone when saying that as I designed it. It was more of a quick hurry put something together so I can get my website launched (a big big no-no but I did it anyway) and well now I am ready for a new design. The trouble is I just can't figure out what I want. So if anyone out there is into logo design, either starting a business or one that you would like to advertise, or if you just do it for fun, seriously e-mail me at emmy (at) emmymom2 (dot) com. I would love to work something out and get a new logo. I would happily advertise for you on my blog, facebook and on my photography web site. Hope you all have a good Monday.. back to working on pictures for me. My goal is to get them done before spring break-did I tell you my kids have two weeks off for spring break! Hope we survive. I hope you find just the right logo, because your talent is rock solid. Beautiful photos! Precious pictures my two favorites are the toes tangled in her necklace and mom holding the baby. If I had two weeks of Spring vacation I wouldn't be going back to work tomorrow! Those are great! I like so many of them - I can't pick a favorite. The logo is ok, but I know you'll come up with something great (just like the pics). I love those bucket pictures. Well I love them all...but the bucket ones are so cute. Good luck with the logo. Ready or not....spring break is fast approaching!! Those are SOOOO cute, Emmy!! Those pictures are just amazing! I LOVE the one with his feet playing with his mama's neclace. So great!! Ooooh! I want one! Sadly, not until Jeffrey is done with school. 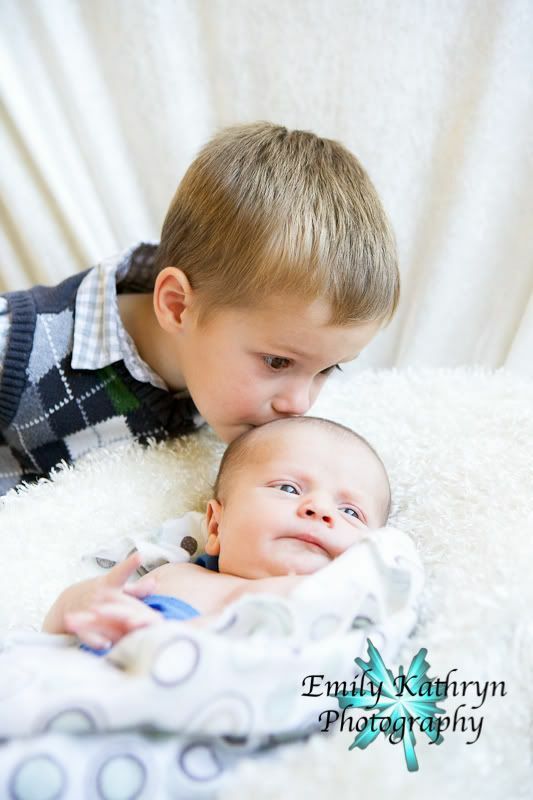 There is just something so special and sweet about babies! And you are such a great photographer! When you are in UT next, I need to hire you! I know how you feel. Today is the 4th which means I am one month away from having a one year old... sigh... just too fast I tell ya. He doesn't even seem like a baby anymore when I look at the pictures of that tiny one! Great photos! I love the feet all tangled in the necklace. Very nice! Oh, those pics are darling! Ethan only has two days off from spring break . . .
Awwww, so cute! Love the one with the baby on the mama's shoulder. You truly are talented! Good luck with spring break! At least you have decent weather and can go outside/to the park. Ugh, I meant, "you're truly talented"! Typing too fast! Those are all darling. My favorite is the one with his feet wrapped up in moms necklaces. I LOVE feet! Cute poses. You are so creative! I totally jelous of your new lens. And my fave pic is the one with the baby toes tangled in the necklace so cute!!! Check out the logos they have done for ideas! what great pictures! It almost wants me want another, just so I can take a picture in a flower pot! Love the one with the feet in th necklace. Beeee-U-tiful photos! 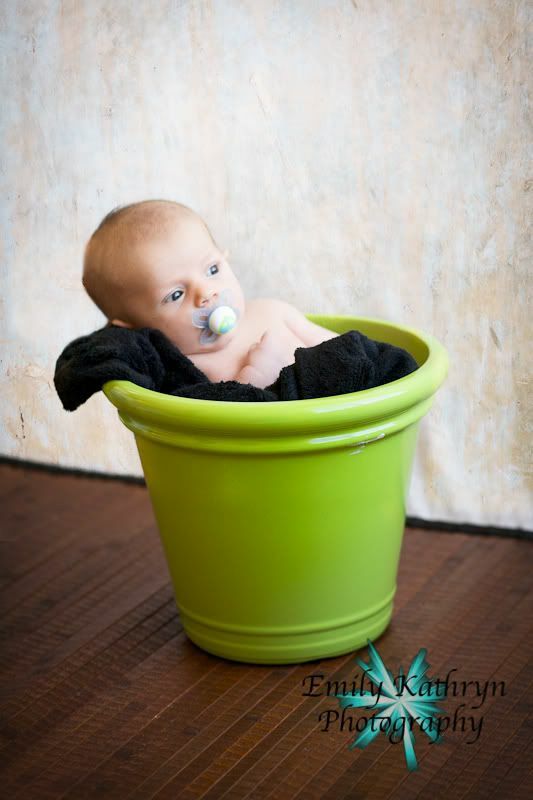 Oh my heart melts at the sight of a beautiful baby and that bucket...precious! These are just gorgeous!!! I love the feet in the necklace. So different! Good luck with your logo. I don't know much about that kind of stuff. So this is the cure for no longer wanting a baby, photographing them, lol! Now if I was only as beautiful of a photographer as you. These pictures are stunning. You are so talented. They are all great shots. I agree a good way to get your baby fix! Glad to see you're still doing well! What a sweet picture of baby and mama!! I love it. Gosh, the baby toes in the necklace just make my heart melt! I'm glad that so many people around me are having babies I can borrow, because otherwise I might be second guessing my decision to be done. Good job! Love the one with the feet tangles in the necklace! Oh my goodness!! SOOOOOOOOO cute! I think I need a lime green pot to put my Jack-Jack in! LOVE it!